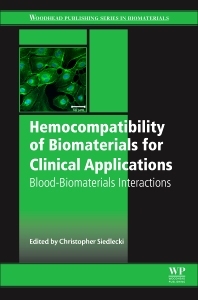 Hemocompatibility of Biomaterials for Clinical Applications: Blood-Biomaterials Interactions summarizes the state-of-the-art on this important subject. The first part of the book reviews the latest research on blood composition and response, mechanisms of coagulation, test standards and methods. Next, the book assesses techniques for modifying biomaterial surfaces and developing coatings to improve hemocompatibility. In the final sections, users will find discussions on ways to improve the hemocompatibility of particular classes of biomaterials and a review of methods for improving medical devices. Christopher Siedlecki is Professor of Surgery and Bioengineering at Penn State University, USA. He has a Ph.D. from Case Western University. Dr. Siedlecki has authored over 70 journal articles and has an h-index of 25. His teaching and research interests comprise physical and chemical properties of synthetic and natural surfaces, protein structure/function relationships, and the development of novel strategies for synthesis and modification of biomaterials.